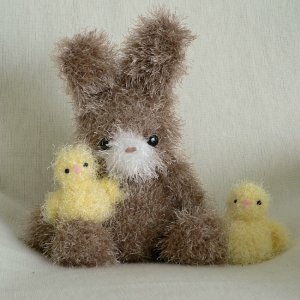 An original crochet amigurumi bunny pattern with FREE chick pattern from the Fuzzy Friends collection by June Gilbank. Bonus Information Guide: All Fuzzy Friends patterns include an additional PDF instruction file called About Fuzzy Patterns. This 4-page reference guide is crammed full of information, tips, and examples for choosing and using both eyelash and fluffy/fuzzy yarns, how to substitute any regular yarn of your choice, and how to brush smooth pieces with a wire brush to give a fluffy result. Size: Finished size will vary depending on yarn used; sample bunny is 11.5" tall as seated (including ears!) and sample chicks are 3.5" tall. Note: Take advantage of the savings when you buy any three Fuzzy Friends patterns of your choice as a custom set! Date Added: 02/22/2015 by Alicia B. Date Added: 07/11/2010 by Kristine T.